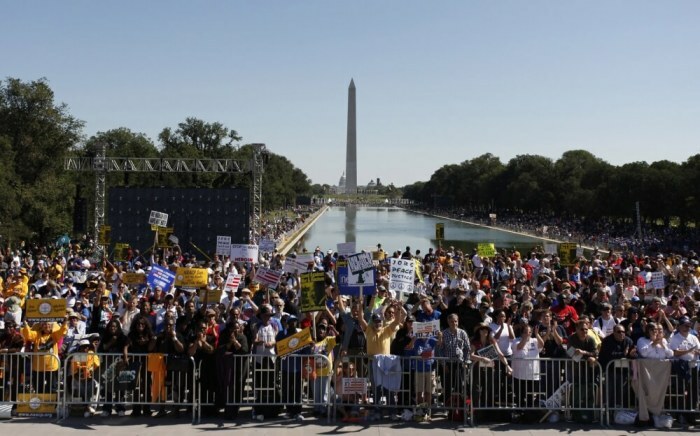 Evangelical leaders are calling on 1 million Christians to gather together in the nation's capital next month for prayer and worship at a historic event called "Together 2016." Adding his name to the lineup of pomenant guest speakers and musicians is Pope Francis, who will deliver a video message addressing the crowd. "We are humbled and honored by his involvement and are eager to share his message with the crowd that gathers at Together 2016," Hall said in a statement to The Christian Post, reacting to the announcement that the pope has added his name to the list of speakers. "That His Holiness would choose to speak into this historic day is a testament to the urgency and the need for followers of Jesus to unite in prayer for our nation and our world." "The times call for this moment," Hall said. "It is time to gather on a large scale and draw our attention back to where it really matters. Our hope and our help are found in Jesus, not in political leaders. We are going to come together, seek God, pray for our nation and pray for unity. Our goal is to gather as a unified front, seeking Jesus and change for our nation through prayer and worship." Confirmed guest speakers and artists include: Hillsong United, Kari Jobe, Francis Chan, Lecrae, Nick Hall, Passion, Crowder, Kirk Franklin, Ravi Zacharias, Jeremy Camp, Andy Mineo, Michael W. Smith, Lauren Daigle, Christine Caine, Mark Batterson, Matthew West,Jo Saxton, Mike Kelsey, Casting Crowns, John K. Jenkins Sr., Josh McDowell, Laurel Bunker, Luis Palau, Tedashii, Tasha Cobbs, Lacey Sturm, York Moore, Trip Lee, Samuel Rodriguez, Ronnie Floyd, Reid Saunders, Bob Lenz, Jose Zayas, Jennie Allen, Nabeel Qureshi, Ann Voskamp, KB, Christine D'Clario, Matt Maher, Sammy Wanyonyi, Lindsey Nobles, Amena Brown, and Josh Brewer.